Here begins a new series of easy, handmade, home-made ideas from my studio for the holidays. I was going to call it Christmas, Old and New, but thought it better to consider winter celebrations of all kinds. And that phrase was way too long anyway. Well, one letter longer than this one. And also, this one has extra meaning for me. When I designed my Sweet Mountain Holiday collection a few years ago, I imagined a little family on a farm somewhere- vintage, rustic, snowy, sunny and very busy with excitement for the holiday. 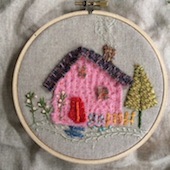 I tried to think of things that everyone would possibly make for handmade gifts- from the barn, the shed, the woods, the sewing room, the kitchen, the junk drawer, the scrapbook, trinket box, even the rag bag. Truth is, that's often what we do here at our house. Since the girls were little, our holidays have centered on our handmade gift exchange. Andy treasures his pinch pots, I adore my tree ornaments and their keepsake boxes, the girls still have their handmade toys and games. Grown up and still fond of the tradition, we try to continue in that way, without insisting though- and the gifts have grown up quite a bit too. So, welcome to the Sweet Mountain Holiday farmhouse. The plan is that you can make most of these projects from simple materials, mostly found at home or easy to rummage nearby. Like these little snowballs from my original collection created for the line. I began with small styrofoam balls, wrapped them with different ivory-colored textiles - yarn, ragstrips, wools - and anchored the tail ends with a few straight pins and a holiday thought snipped from a book. Nested in an old basket with greens and sparkle bits, they make a pretty tabletop decoration for any spot at home. So, so simple. Add thread hangers and you have a basket of ornaments suitable for a gift. No wrapping needed, just tuck a gift tag inside. Who wouldn't love that? oh, so pretty. And these would be perfect for after-Christmas decor, too, wintery and white. Charlotte! The yarn balls are gorgeous. Can't wait to see what you are doing for Bethany Lowe! Oh, I love these. So simple and pretty. Love you basket of handmade snowballs. This is a nice idea Charlotte, but then, all your ideas are wonderful! Congratulations on your spring line!